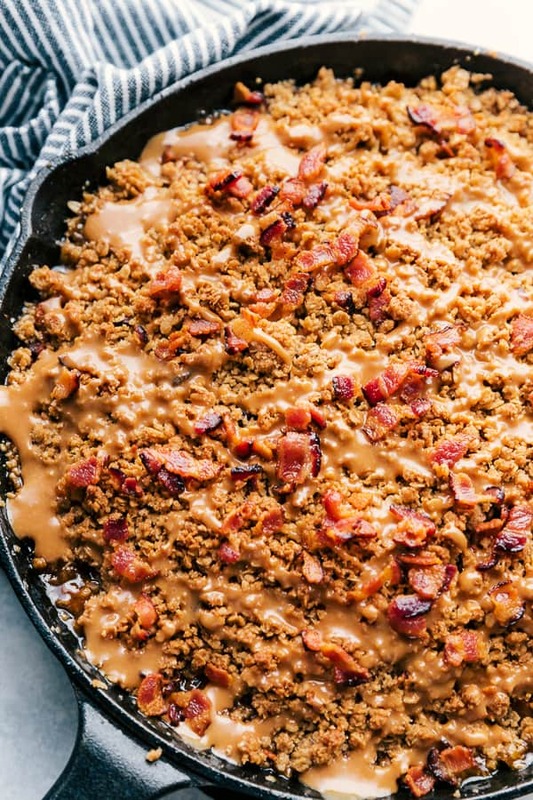 This Bacon Caramel Apple Crisp is your favorite comfort food elevated to the next level! Pure Farmland Bacon is a key ingredient. It is all natural, contains no MSG, artificial ingredients, preservatives or added hormones. This is one apple crisp recipe you need to add to your must-make list! Looking at this picture you can see that it’s the perfect amount of savory with the right amount of sweet. It was SO hard to not dig in before taking pictures! I am proud to be partnering with Farmland in association with American Farmland Trust to bring you this sponsored Bacon Caramel Apple Crisp. I have been compensated but as always all opinions are 100% my own. This apple crisp dessert is your favorite comfort food with apples, cinnamon, and a streusel topping. Now it’s made even better with the addition of Pure Farmland All Natural Uncured Bacon and even a bacon caramel! I mean, does dessert really get any better than this??!! Whether I’m making something for breakfast, lunch, dinner or dessert, it’s important to have healthy options. I don’t want to second-guess what ingredients I’m adding to any recipe. Farmland knows that. Hence, the creation of their Pure Farmland product line. The consumer’s well-being is at the forefront of each Pure Farmland product. There are no hidden ingredients in this bacon, it is free from artificial ingredients, preservatives, MSG and added hormones. You can feel confident and not worry when you serve these delicious, pure products to your family at any meal. Providing pure products to consumers and promoting the sustainability of America’s farmland is important. 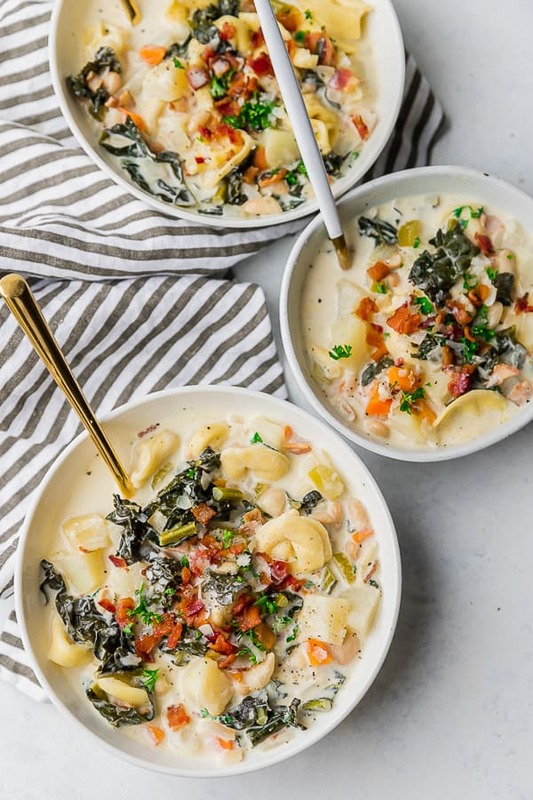 That’s why, Farmland partnered with American Farmland Trust and from now until December 31, 2019, Farmland has pledged to protect one square foot of American farmland for every specially-marked Pure Farmland item purchased, up to $140,000. Farmland wants to help continue American Farmland Trust’s mission to promote sound farming practices, protect America’s farm and ranchland, and enable farmers and ranchers to continue working on their land. 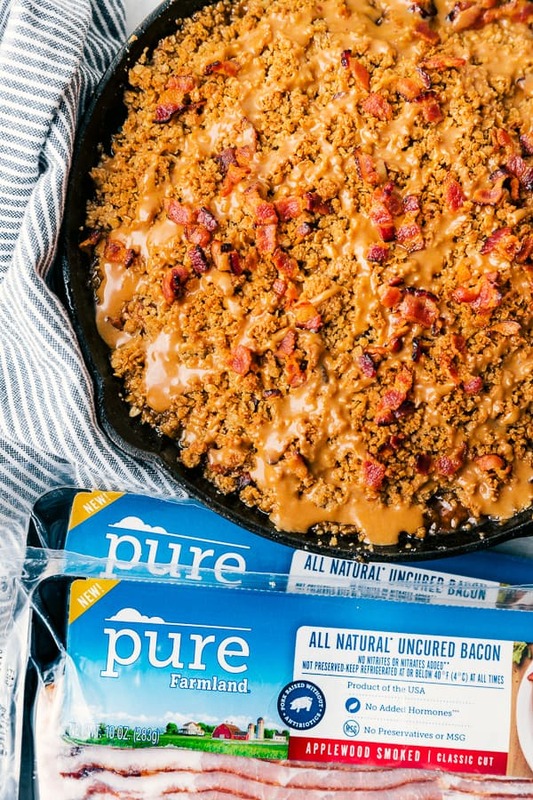 Purchase specially-marked packages of Pure Farmland Bacon to make this Bacon Caramel Apple Crisp along with other Pure Farmland items to make your meals. Each purchase will assist Farmland with their donation. Visit American Farmland Trust to learn more about their organization. You’ll see what they’ve been able to do, and how they’ve helped and are helping so many farmers and ranchers around the nation. You can also read what they’re doing to continue their mission, and how you can be a part of it. 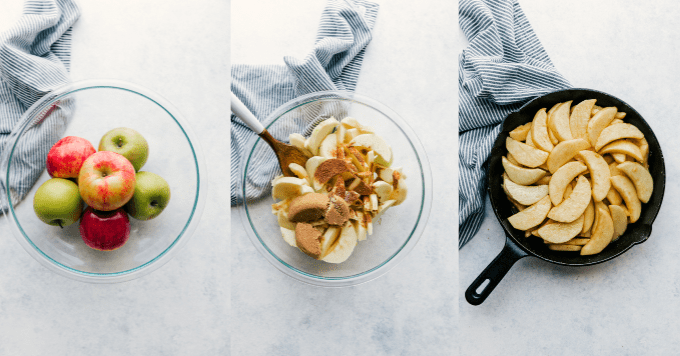 SAVE THIS BACON CARAMEL APPLE CRISP TO YOUR FAVORITE PINTEREST BOARD! 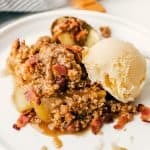 I just cannot say enough about using Pure Farmland bacon in this apple crisp. It’s like the next peanut butter and jelly, milk and cookies, bread and butter, macaroni and cheese combination! You just can’t (and shouldn’t!) have one without the other. And that bacon caramel sauce?! Mamma Mia!! I was eating that stuff with a spoon it was SO good! You can bet I’ll be drizzling that stuff on my ice cream real soon, too. I use a combination of Granny Smith and Honeycrisp apples and we like those best, but feel free to experiment with others. 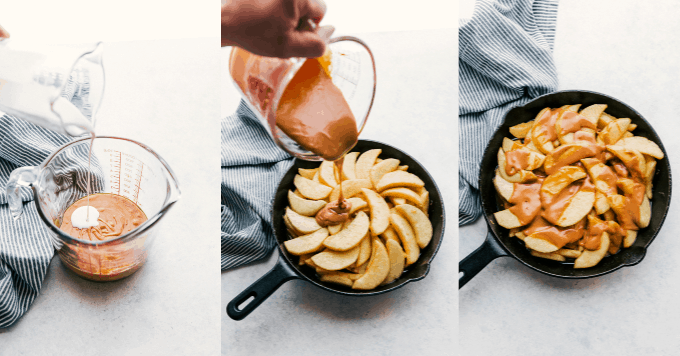 You can use any oven-proof skillet, but I prefer the way the Bacon Caramel Apple Crisp cooks in my cast iron skillet. Personally, I think most things just taste better when made in a cast iron skillet. As always, be sure to read through the recipe before you begin making it. It’s important that you allow some of the Pure Farmland bacon grease to remain in the pan as well as reserving some for the caramel. Microwave the caramel squares. There’s no need to put them into a double boiler on the stove. I found it easiest and quickest using the microwave. 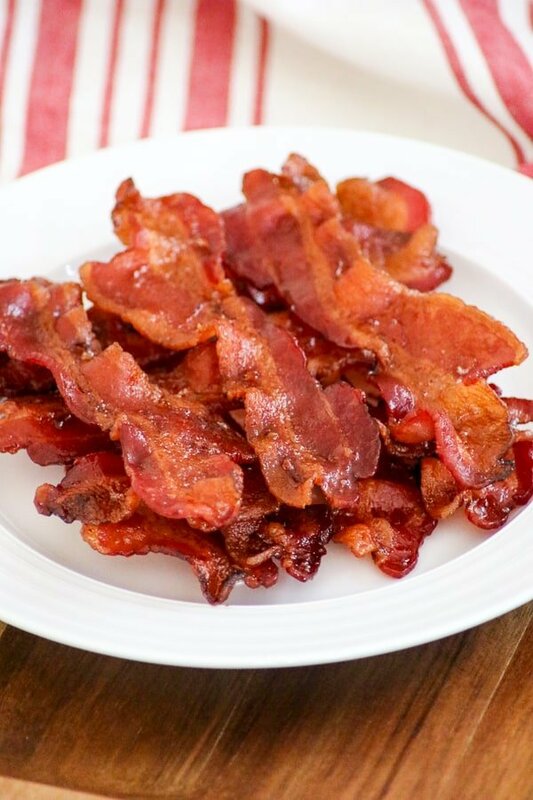 Be sure to save a couple of pieces of the Pure Farmland bacon to sprinkle on the top! You’ll crumble four of them to use in the streusel topping, but adding a bit to the top before and after you drizzle the caramel is a bonus, too! Serve it with a scoop of vanilla ice cream. It will melt into the Bacon Caramel Apple Crisp so perfectly with the creamy texture adding another level of deliciousness. 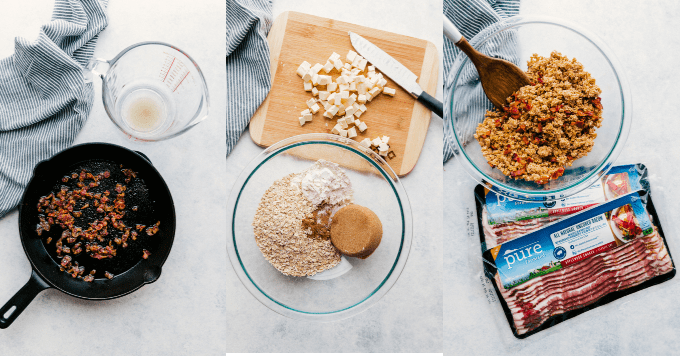 Of course, I love eating bacon all by itself, but I also love adding it to recipes too (obviously), and so do a lot of my blogger friends! Miss Rebecca from Foodie with Family made these Bacon Fried Apples with Onions right out of a Laura Ingalls Wilder book. Boy, they sure do sound delicious. I’m going to have to make them for a side dish real soon! Of course, everyone LOVES bacon for breakfast, so why not make these Apple Bacon Cheddar Waffles recipe from Carrian at Oh, Sweet Basil? I’ve never had bacon IN my waffles, but I sure would like it! A salad is just a much better salad if there’s bacon on it, right? 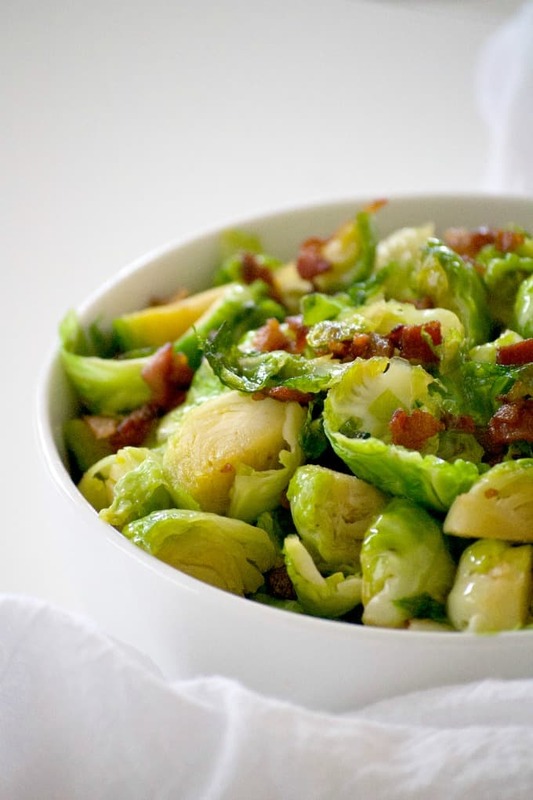 So why not add some AND make this Bacon Vinaigrette recipe from Robyn at Add a Pinch? I’ll definitely be eating more salads when I put this dressing on them! 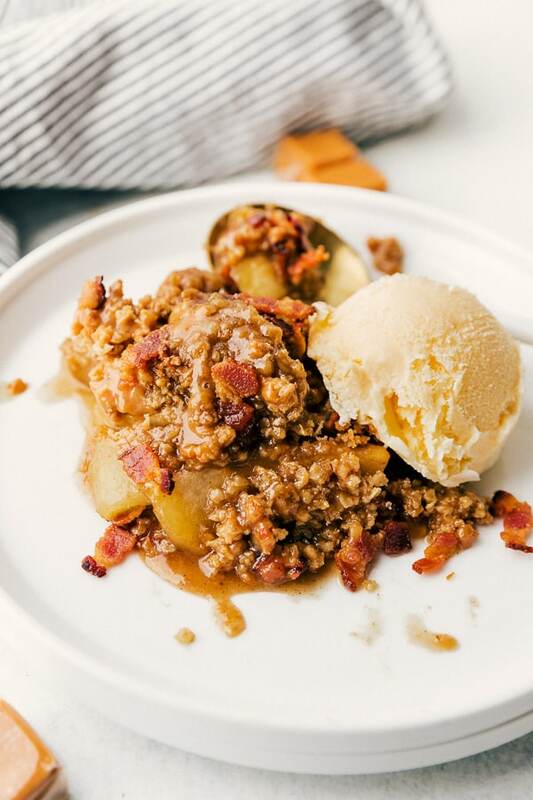 This Bacon Caramel Apple Crisp made with Pure Farmland Bacon will be your next favorite dessert. The perfect amount of salty with the right amount of sweet! 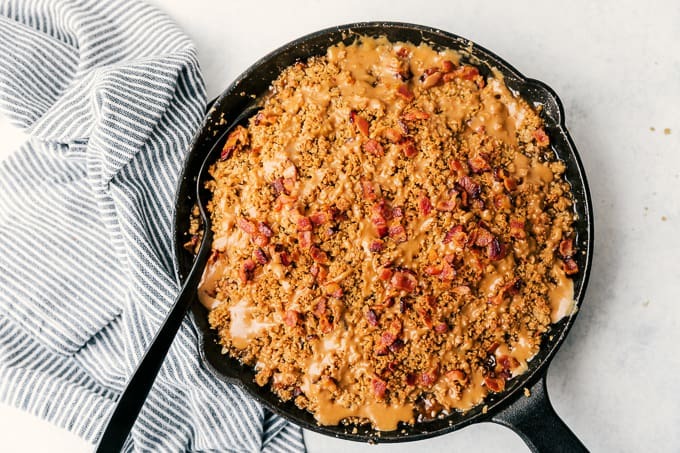 It's your favorite comfort food with apples, cinnamon, and a streusel topping made even better with the addition of bacon and caramel! In a large bowl, place the oats, flour, 1/2 cup light brown sugar, 3/4 teaspoon cinnamon, nutmeg, and salt. 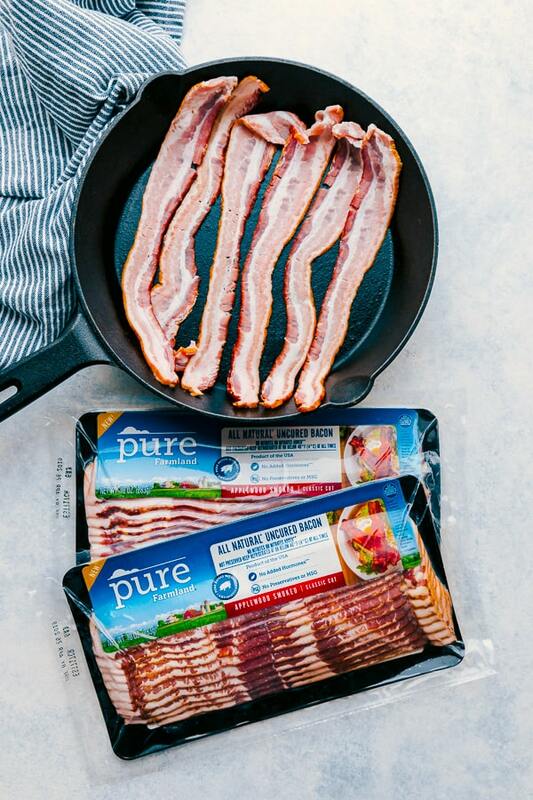 In a 10-inch cast iron skillet or oven proof pan, cook the 6 slices of Pure Farmland bacon over medium heat until crisp. Remove pan from heat and place the bacon on a paper towel-lined plate. Place two teaspoons of the bacon grease into a large microwave-safe measuring cup or bowl and leave remaining grease in the skillet. Crumble 4 of the Pure Farmland Bacon slices and mix them into the streusel topping. Peel, core, and chop the 6 apples and place into another large bowl. Toss with the fresh lemon juice. Add the light brown sugar, the teaspoon of cinnamon, and salt and toss to completely coat. Reheat the cast iron skillet over medium heat and melt the tablespoon of butter. Add the apples and cook for about 5 minutes, tossing in the butter and bacon grease as they cook. Unwrap the 36 caramels and place them into the microwave-safe cup or bowl with the two teaspoons of bacon grease. Microwave for 30-second increments until smooth, mixing in between each. Add the two tablespoons heavy cream and mix until thoroughly combined. Pour 2/3 of the caramel sauce over the apples, and sprinkle the streusel topping evenly over the apples. Before serving, drizzle with remaining caramel. You will probably have to reheat the caramel again for 20-30 seconds so that it can be poured. Crumble the 2 remaining Pure Farmland Bacon slices and sprinkle over the top. If desired, serve with vanilla ice cream.